Outdoor bench cushions considerably optimize the comfort of your outdoor seatings and come in a myriad of colors, patterns, and finishes to offer you the possibility of completing the decoration of your garden or terrace down to the smallest details. The bench cushion is an outdoor accessory that will become indispensable for the return of sunny days! Make your garden a good place to live by decorating it with cushions. They allow you to enjoy more comfort in your outdoor spaces. Specially designed for outdoor use, the decorative cushions are strong and durable. How to choose an outdoor bench cushion? 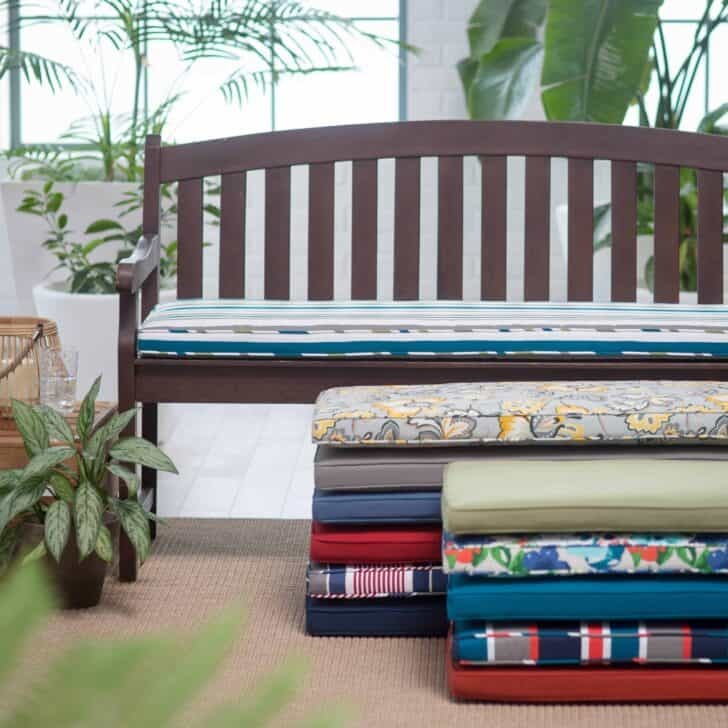 Alongside a garden armchair or facing a coffee table, the bench cushion complements any style of outdoor design by bringing an extra dose of comfort to your favorite seat. Indeed, it's filling - traditionally cotton - gives the bench cushion a soft character very appreciable when you sit outside your home. As for its coverage, it can be made of cotton, but also of polyurethane or polycotton; it is up to you to choose the fabric that seems most pleasant to the touch. In addition, the bench cushion adapts to all styles of garden benches whether you have a two-seat garden bench or a seat designed to seat several people, there are outdoor bench cushions in various sizes, ranging from forty cm to a hundred cm in length for large outdoor benches. How to combine comfort and elegance in the garden? 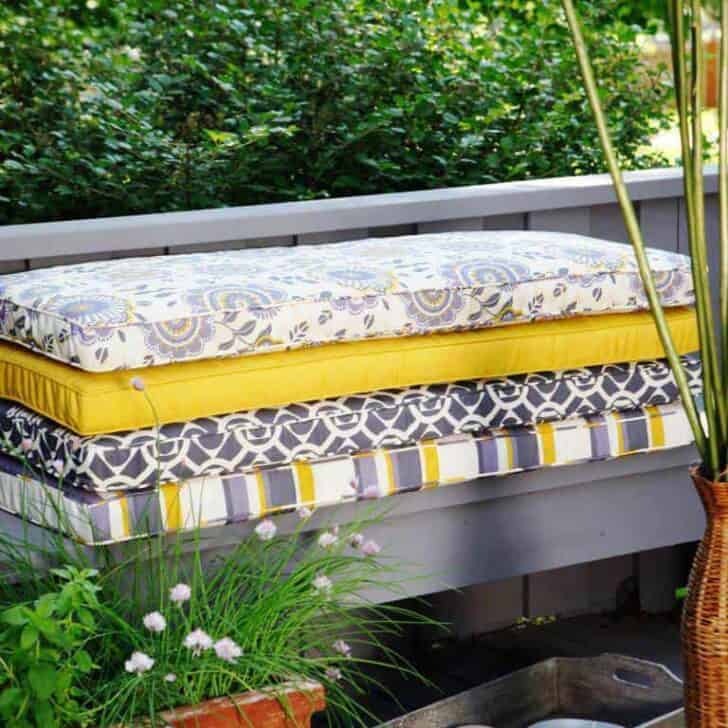 Dress up your outdoor benches with seat cushions and patties! According to your taste, choose colored or natural, washable or removable cushions. These accessories for outdoor benches guarantee you optimal comfort for your relaxing afternoons... and your garden benches are resolutely trendy! 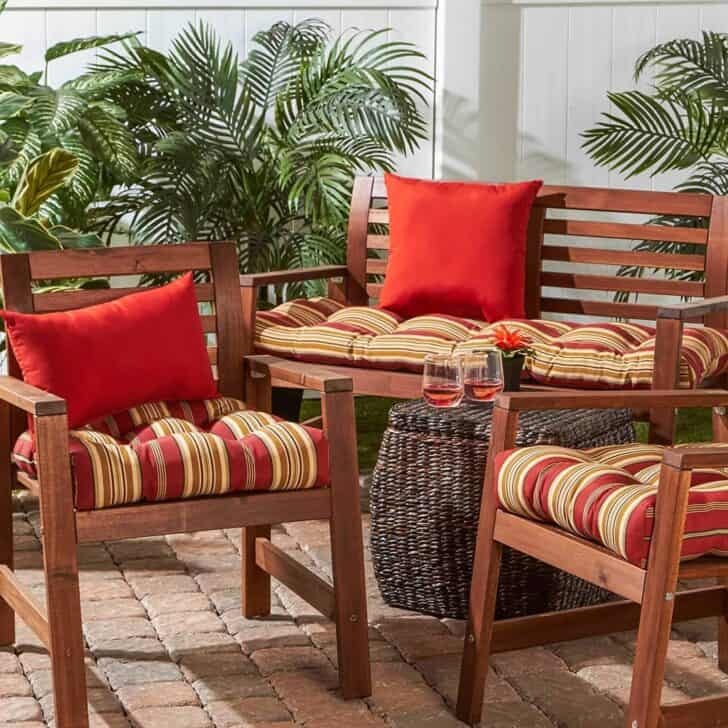 Add a touch of color to your outdoor decor with bench cushions in a variety of colors and patterns. You will necessarily find a bench cushion in perfect harmony with your garden's style! A cushion for a bench with blue and white stripes on a natural wooden garden bench, and you will have there a set of garden furniture that invites the big holidays in your house! Liberty motif and pastel colors dress a bench cushion that will sit delicately on a white wrought iron garden bench, for a romantic and bucolic atmosphere outside your home. With a plain bench cushion (such as purple or white) on a black braided resin outdoor bench, your garden decoration will retain a certain elegance and glamour. There are soft mattresses that can easily be placed on your garden bench to make your sitting even more comfortable. Depending on the length of your bench, you can put one or two. We have selected several mattress colors: white, sand and red. Again, we advise you to check the fabric composition to ensure that it is weather resistant. It's a real plus if the mattress can be removed. An outdoor cushion means you want to leave them outside during the summer season. We, therefore, recommend that you choose an outdoor fabric such as Sunbrella. This fabric is treated upstream to resist water, grease and UV rays. It is easy to clean and keeps its color over time. It's a real plus if your cushion can be removed! You can machine wash it in the blink of an eye. Be careful not to spin or dry it in the machine because you will lose the absorbent and protective quality of the fabric. Now get an even richer texture and elegant style! Enhanced Cinnabar with a new highly textured fabric that is sure to get compliments all season long. Add the perfect blend of color and comfort to any space in your home with this bench cushion from the Pillow Perfect Cinnabar Collection. Dimensions: 45 in. L X 18 in. W X 2.5 in. D.
Outdoor Swing/Bench cushion. Bench cushion measures 44 x 17 x 4 inches. Circle tack tufted with string ties to fasten securely to your outdoor swing bench. Cushion dimensions are +/- 2 inches. Overstuffed construction for extra comfort and longevity. 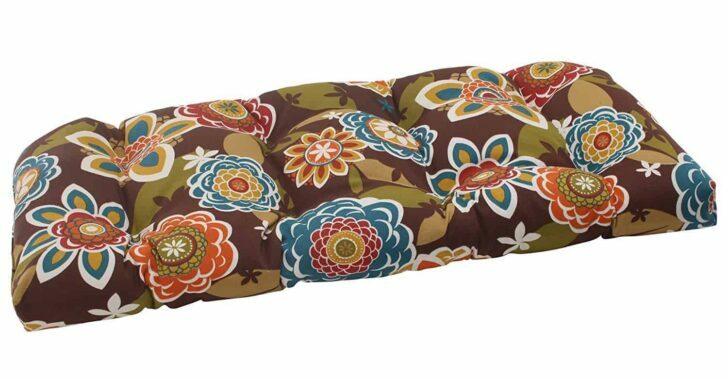 Add the perfect blend of color and comfort to any space in your home with this bench cushion from the Pillow Perfect Carmody Collection. Dimensions: 45 in. L X 18 in. W X 2.5 in. 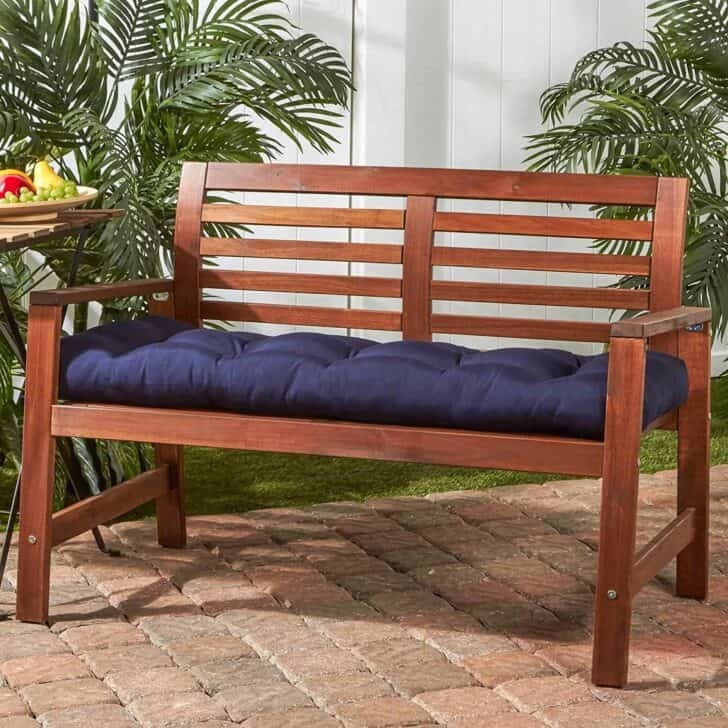 D.
Add a stylish & contemporary accent to your outdoor furniture with this Greendale Home Fashions outdoor bench cushion. This cushion measures 51" x 18" x 4", & features a 100% polyester, fade, stain & water resistant UV coated fabric. The cushion's poly fiberfill is made from 100% recycled, post-consumer plastic bottles, & overstuffed for added comfort, strength & durability. Cushions are circle tufted to prevent fill from shifting. A variety of modern prints are available. Outdoor Bench cushion. Bench cushion measures 51 x 18 x 4 inches. Circle tack tufted with string ties to fasten securely to your outdoor swing bench. Cushion dimensions are +/- 2 inches. 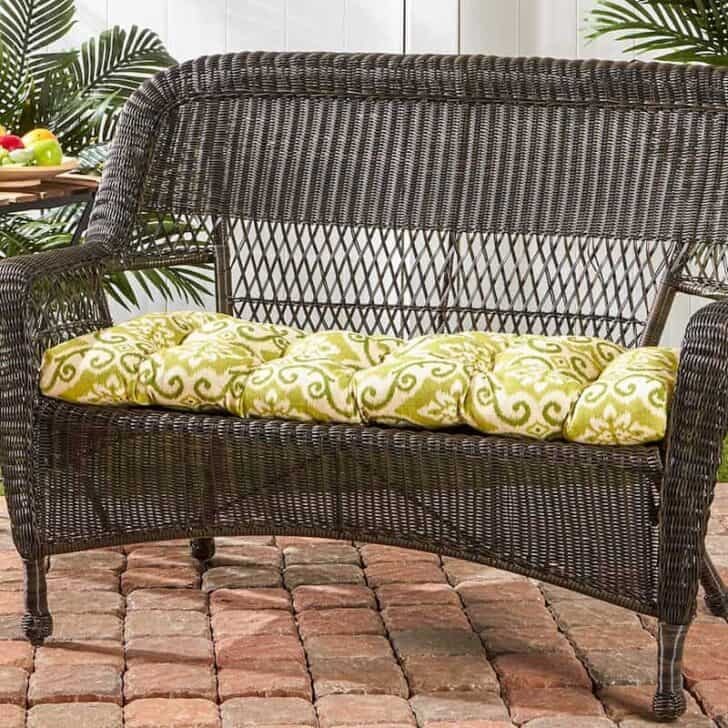 Add the perfect blend of color and comfort to any space in your home with this wicker loveseat cushion from the Pillow Perfect Annie Collection. Dimensions: 44 in. L X 19 in. W X 5 in. D.